So quietly... No woman was in that car, obviously. They can't believe they are still alive. 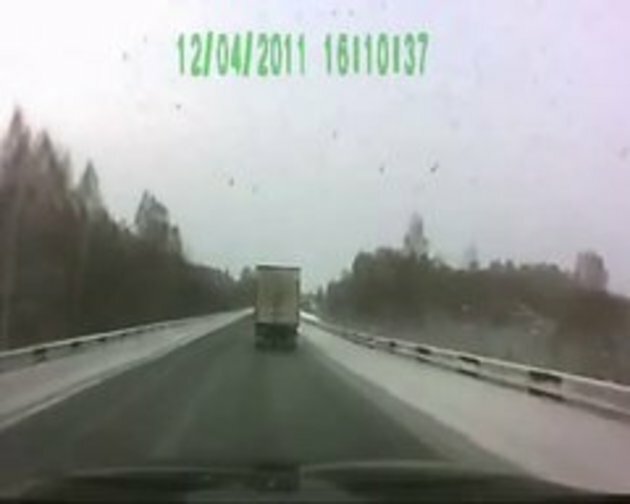 The lesson of the day is that when being behind a bus or truck, don't think of getting ahead of it; not even if it stops. You never know what lies ahead of its' blocked view. Holy Smoke,just wasn't their time to go! @ avolyte (submitter) you beat me with this video, I post it few days ago but i'm happy it's posted. Great vid !! Those guys in the van are lucky to be alive ! #4 I like to translate , but then my comment wil be removed as "Inappropiate"
They are lucky, they get born for the second time in that moment. the inside of that car must have smelled terrible after they shat themselves! They seemed pretty cool about that one. When I took my drivers license I learned, never swerve into oncoming traffic. Always go for the ditch/barrier to the right. Disobeying this simple rule almost killed those guys. 0:40 Hey, he turned, look. 0:56 I tried to selects reverse, but [end of the video]. #21 "???" is not a soft, even friendly word for a bad guy. #24 It is where I live, at least. It is used in that way.